Kentucky Public school teachers rally outside the House Chamber for a "day of action" at the Kentucky State Capitol to try to pressure legislators to override Kentucky Gov. Matt Bevin's recent veto of the state's tax and budget bills. (CNN) - Inspired by her special needs students, Leslie Busch joined her fellow teachers Friday at the state Capitol in Frankfort in what the Kentucky Education Association called "a day of action." If public education doesn't get additional funding, Busch said, more families will turn to charter and private schools, some of which won't accept students with special needs or will make them pay more to attend. "That's unfair," Busch told CNN. "I am adamant about giving my students a fair chance to be a working member of society when they grow up." Dozens of public school districts throughout Kentucky canceled Friday's classes to allow teachers and school personnel to attend the Capitol rally, according to CNN affiliate WLKY. Gov. Matt Bevin, Republican, bemoaned the teacher protest, telling reporters outside the Capitol that school closures put some children at risk. "I guarantee you somewhere in Kentucky today a child was sexually assaulted that was left at home because there was nobody there to watch them," the governor said, according to CNN affiliate WDRB. "I guarantee you somewhere today, a child was physically harmed or ingested poison because they were home alone because a single parent didn't have any money to take care of them," he continued. "I'm offended by the idea that people so cavalierly and so flippantly disregarded what's truly best for children." He also claimed that some children were "introduced to drugs." The Kentucky Education Association also strongly opposes a pension reform bill that Bevin signed this week under which new hires will have to enter a hybrid cash-balance plan, as opposed to a traditional pension. It also limits new sick days teachers can put toward their retirement. 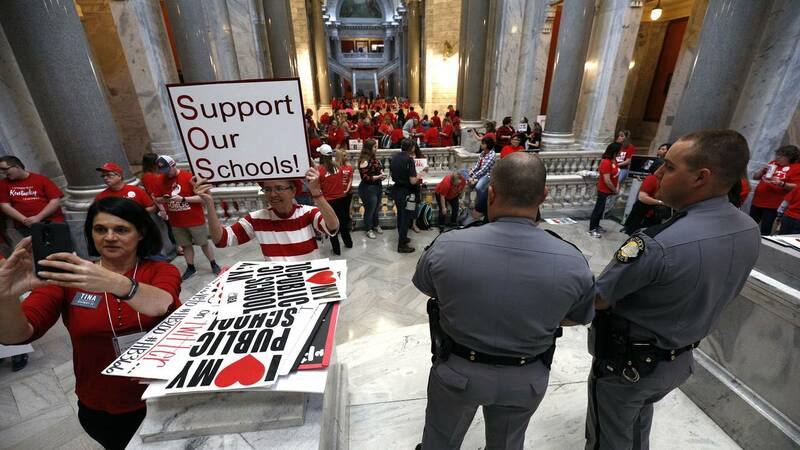 Members of the teachers union also were critical of Bevin's vetoes of budget and revenue bills, both of which the union said are crucial to funding public education. On Friday night, legislators in the Republican-controlled Senate voted to override the vetoes. "We acknowledge neither bill gives the citizens of the Commonwealth everything that our students, their parents and our communities need." the Kentucky Education Association said on Facebook. "However, both bills provide much needed P-12 funding for the next biennium." The governor tweeted his disapproval. "We have time to do this correctly. The people of Kentucky deserve nothing less. Transparency makes for good policy AND good politics," he wrote. "I have met with House and Senate leaders all week to propose more responsible ways to pay for 100% of the requested education funding. Crickets." Teachers in other states also have been pushing for better pay and conditions, inspired in part by a successful strike last month in West Virginia. Oklahoma Education Association President Alicia Priest said it was time for students to go back to school. Priest claimed the teachers had secured a "victory" with $479 million in additional school funding. But the union ended the walkout with about the same amount of spending teachers were promised before it began. Gov. Mary Fallin signed a bill shortly before the start of the walkout that raised spending on teacher and support staff pay by $405.5 million -- netting teachers and staff a $6,100 raise and a $1,250 raise, respectively. But the Oklahoma Education Association wanted teachers' raises to be $10,000 on average. Another piece of legislation also raised education funding, providing more than $70 million over the next fiscal year for textbooks, state aid and flex health care benefits. The union also wanted those numbers to be higher. Priest said the union had polled members throughout the walkout, and that by Thursday, 70% of respondents indicated they were unsure of continuing. But some teachers said they were not surveyed before the walkout was called off. "The OEA doesn't get to decide when I'm finished," said middle school choir teacher Renee Jerden. "I feel like it's a cop-out -- we have let them win by showing them they can behave however they want, and we'll eventually get tired and go home." In Arizona, Gov. Doug Ducey's announcement Thursday of a plan to give teachers 20% pay raises by 2020 was met with some skepticism. The Arizona Educators United coalition had called for 20% pay raises, but it wasn't satisfied after Ducey's announcement. "This has made more questions for us than answers," said Noah Karvelis, a teacher and an Arizona Educators United organizer. "We don't know the details. We don't know the funding sources." Under Ducey's proposal, teachers' pay would increase 9% in the 2018 school year, then another 5% for the next two years, boosting the average salary to $58,130 from the current $48,372 by 2020. Teachers in the state held "walk-ins" Wednesday before the start of classes, calling for higher salaries. They gathered outside schools, wearing red shirts and carrying signs before walking in to teach their first classes of the day. The rallies were just the latest escalation in recent weeks for educators and their allies to voice their frustration. The group started by encouraging teachers to wear red to school on Wednesdays, using the hashtag #RedforED in social media posts.